Movie Review: Mexican actor Diego Luna, most known for his role in “Y Tu Mama También” and other supporting roles in “Frida”, “Milk”, and “Elysium”, chose Cesar Chavez’s inspiring deeds to direct his first English-language film, a biopic whose good intentions didn’t come to be nothing more than… good intentions. 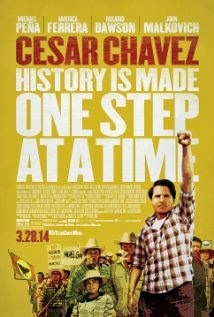 Set in Delano, California, the film covers the period from 1962 to 1970, when Chavez assumed himself as a civil-rights activist and labor-organizer, forming the United Farm Workers union and pacifically fighting against the injustices and discriminations that Filipino and Mexican farm workers were subjected to. To achieve his purposes, Chavez embarks in a strike hunger and promotes other non-violent strikes, inevitably forcing his employer, Bogdanovich, to sign a fair contract many years later. John Malkovich, in his habitual class, had a noteworthy performance, while Michael Peña, as main protagonist, played his part acceptably. As happened with another recent biopic, “Mandela: Long Walk to Freedom”, ”Cesar Chavez” seemed more concerned in touching the viewers’ hearts and gain sympathy for the cause it depicts, than really presents us with an insightful portrait sustained by a solid narrative. The sentimental inclinations evinced throughout the film were reinforced with Chavez’s family life, particularly regarding his bullied son, Fernando. Diego Luna showed difficulties to escape the unchallenging approach and structure, basic visuals, and one-speed pace, which turn “Cesar Chavez” in another bland biopic.